I’m always up for trying out new dining experiences, mixing things up now and again. I used to be a fussy eater, never really giving things a chance. However, since moving out of my parent’s home three years ago, I’ve gotten a lot better. My housemate has gotten me to try so many different things and I’ve been pleasantly surprised. I never would’ve touched calamari or halloumi and now, you’ll find me ordering it at a restaurant if it’s on the menu. When Sapporo Teppanyaki got in touch and asked if I wanted to try out their Manchester branch, of course I said yes. The Japanese inspired eatery has an extensive menu with a Western-twist, so if you are a fussy eater, there will still be something for you. I met my mum on Market Street and we made our way to the restaurant, which is located near the Museum of Science and Industry. If you’re familiar with Manchester, you’ll know that Market Street and MOSI aren’t exactly close together, so when booking, be aware of this. 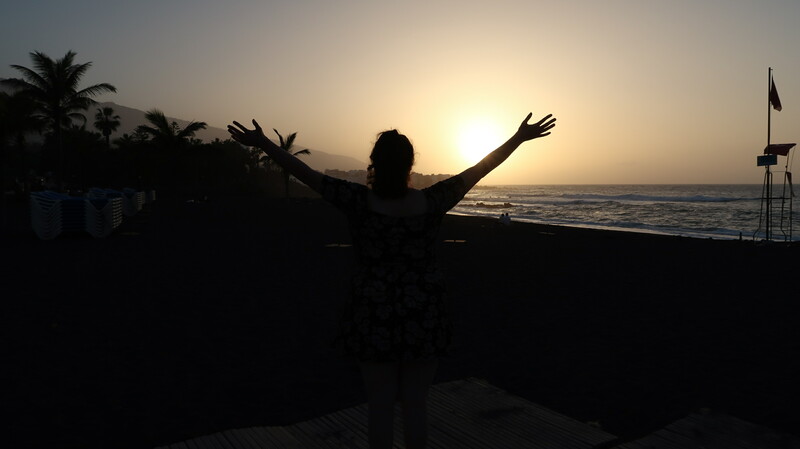 Upon arrival, we were guided through the menu, with the waitress explaining that the starters and small plates are prepared in the back kitchen while the main dishes are cooked fresh and right in front of you. At Sapporo Teppanyaki, the dining is very much a communal experience. Each table seats up to 20 people, so if there’s a small number in your party, you will be sat with strangers. This may be off-putting to some people but it adds to the experience and in most cases, you’ll end up with a friendly bunch and get chatting. After the staff explaining the menu to us, I decided on Calamari for starters and my mum went for Ribs. 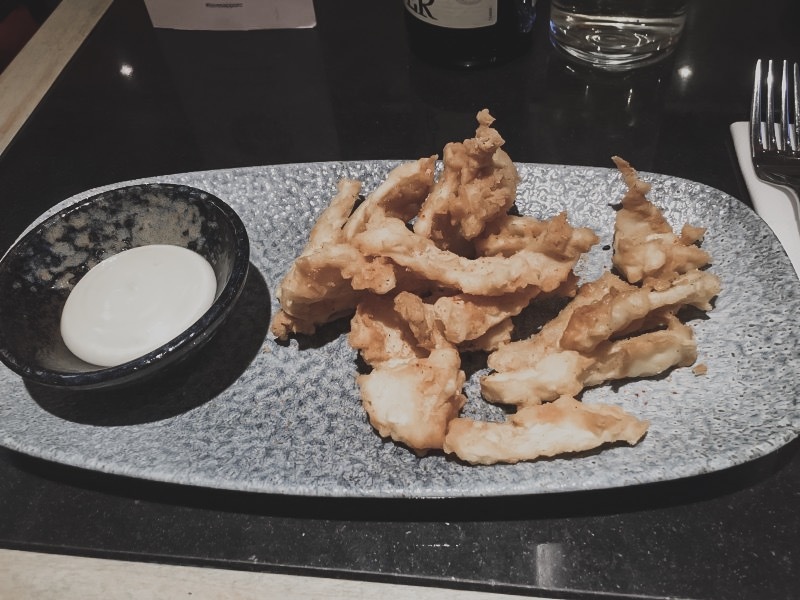 The Calamari was some of the best I’ve ever had, coming up a close second to time I ate it at a restaurant on the beach in Turkey. Rather than the traditional garlic mayo it’s usually served with, it came with a Jalapeño infused dip that gave it a nice kick. On the Rib front, my mum really enjoyed them. They were tender and covered in sauce that was a little hot, a little garlicky and a little barbecue-y. Both were massive portions and we were already getting full after! As we were finishing up our starters, more diners started to arrive and the chef came over to prepare his work station in the middle of the table. For mains, we had both decided on a teppanyaki dish. I opted for chicken and my mum went for Sirloin. 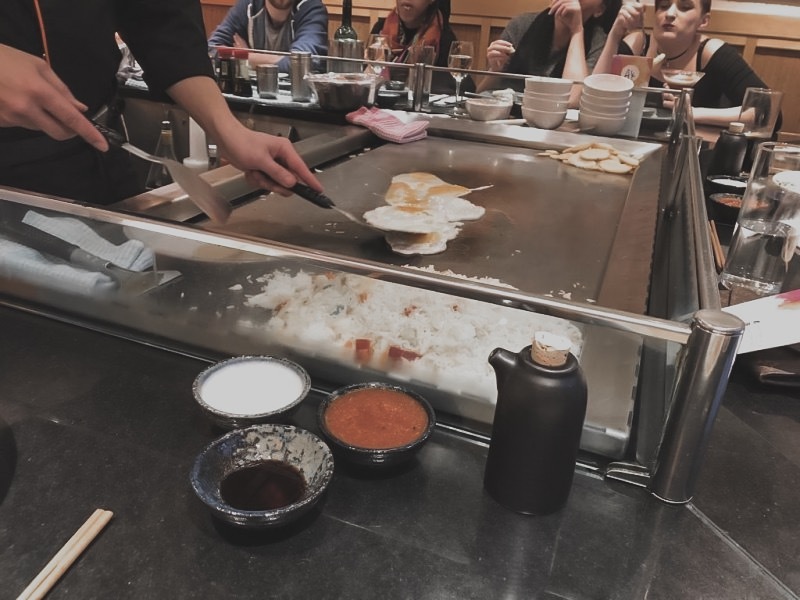 Each teppanyaki dish is served with sautéed potatoes, stir-fry vegetables and egg fried rice, all freshly cooked and served right in front of you. Each component is encouraged to be eaten as it’s served, so we began with potatoes and vegetables. Rice came next, before the meat was cooked however you liked. Again, the portions were massive and by the time the rice and meat was served, I was struggling! The chicken had SO much flavour and was almost overpowering with garlic, so much that I had to scrape some off. However, that is just personal preference and next time I will ask for it without. My mum asked for her steak medium-rare and it was cooked to perfection. The sauce complimented it really well and was a huge hit with her. 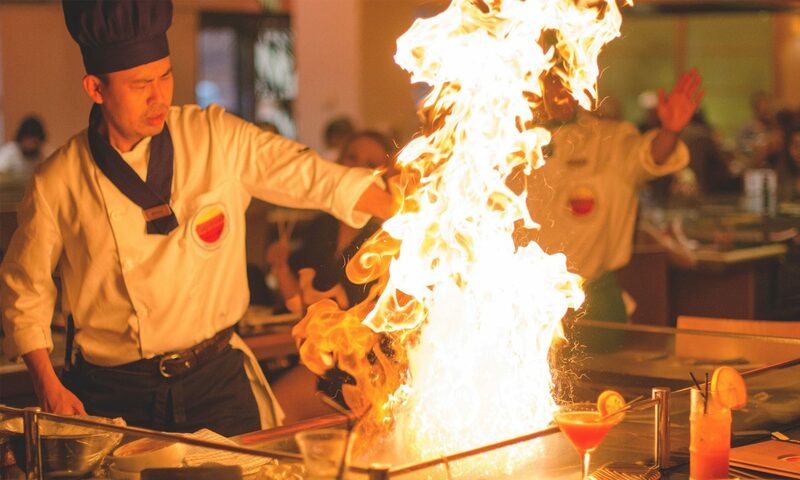 When dining out, you don’t expect to get slices of potato chucked at your face and knives being juggled just that little bit too close to you, but at Sapporo Teppanyaki, it’s all part of the unique and theatrical experience. As we were finishing up, we were asked if we would like to see the dessert menu. On this occasion, we were far too full up, but next time we will definitely be saving room. The chocolate spring rolls sound delicious! All in all, we had such a wonderful experience at Sapporo Teppanyaki, with great food and entertainment that got people laughing and talking. I can just imagine it being even better with a large group, perhaps on a Birthday or Work party. Should you consider investing in Manchester property? 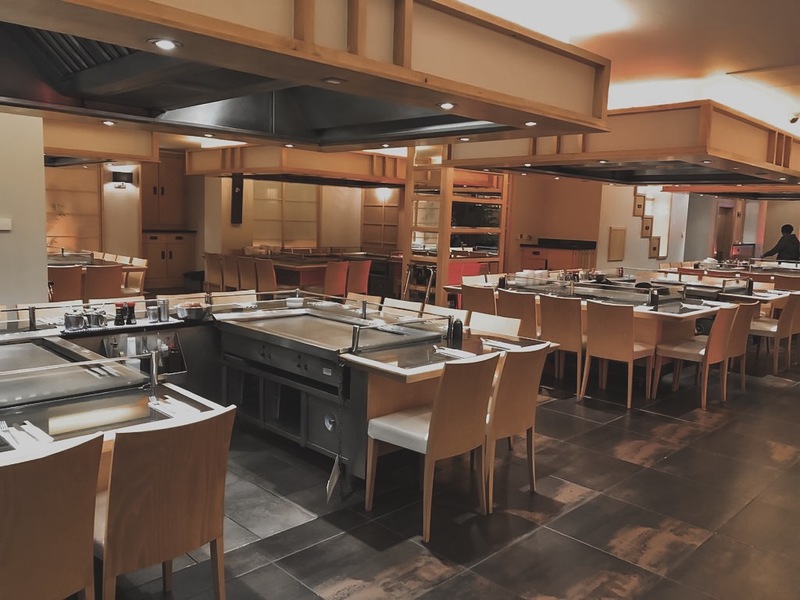 I was invited along as a guest at Sapporo Teppanyaki and my meal, along with a +1, was free of charge in exchange for an honest review.